Germantown Academy alumna Danika Gottbrecht '13, who graduated from Guilford College this past spring, has received a Fulbright U.S. Student Program award to Germany from the U.S. Department of State and the J. William Fulbright Foreign Scholarship Board. Gottbrecht will support the teaching of English in Rheinland-Pfalz, a German state bordering France, Belgium, and Luxembourg. "Being named a Fulbright fellow is an honor and an absolute joy," said Gottbrecht, who majored in French and International Studies and minored in German. "Upon receiving my notification email, I immediately thought of my grandfather, who also participated in the Fulbright Program while studying at the University of Pennsylvania. I believe that the Fulbright Program fosters further international cooperation and encourages global citizenship. In the future, I hope to use my experiences abroad to pursue a career in international diplomacy and government work." Gottbrecht is one of over 1,900 U.S. citizens who will conduct research, teach English, and provide expertise abroad for the 2018-2019 academic year through the Fulbright U.S. Student Program. Recipients of Fulbright awards are selected on the basis of academic and professional achievement as well as record of service and leadership potential in their respective fields. The Fulbright Program is the flagship international educational exchange program sponsored by the U.S. government and is designed to build lasting connections between the people of the United States and the people of other countries. The Fulbright Program is funded through an annual appropriation made by the U.S. Congress to the U.S. Department of State's Bureau of Educational and Cultural Affairs. Participating governments and host institutions, corporations, and foundations around the world also provide direct and indirect support to the Program, which operates in over 160 countries worldwide. Gottbrecht's grant period will start in September 2018 and last until June 2019. "While I am in Europe, I hope to travel a bit, time permitting, and continue some personal research on language usage in border regions," said Gottbrecht, who was exposed to the German language at a young age. "My grandparents immigrated from Germany to the United States, and my own parents grew up bilingual. Though I did not receive any formal German instruction until high school, I can recall hearing the language during my childhood. Additionally, my family always encouraged international travel and we returned to Germany regularly to visit our extended family that still lives there. After I graduated from GA, I also took a gap year and lived in Switzerland for a semester. This experience allowed me to practice my German and develop an interest in sociolinguistics and dialects, which I pursued during my undergraduate career." Strasbourg is renowned for its fascinating fusion of French and German cultures, creating a unique blend that you cannot find anywhere else in the world. The Alsatian culture — and dialect — is a part of the region's identity as well as its local history. Over the past few hundred years, Alsace has experienced both French and German control, which allowed me to speak both languages during my semester abroad. Though I was living in France, I spent the latter half of my semester crossing an international border to go to work every day. I completed two internships in the small German town of Kehl; for my first internship, I worked at the European Consumer Centre — also known as the Centre Européen de la Consommation or Zentrum für Europäischen Verbraucherschutz — a binational organization focused on resolving cross-border litigations between EU consumers. Every EU state has its own consumer center to mitigate these issues, but the European Consumer Centre is the only binational organization in the entire EU structure, demonstrating the importance of Franco-German cooperation today. My second internship was held at the Euro-Institut, an organization which supports trinational actors in the Upper Rhine region (think France, Germany and Switzerland) with cross-border projects and political collaboration. My main function in these two organizations was to serve as the native English speaker and assist the teams with finding accurate translations for all of their websites and publications. "Strasbourg is an incredible place, especially for those interested in border studies and pursuing multiple languages," said Gottbrecht. 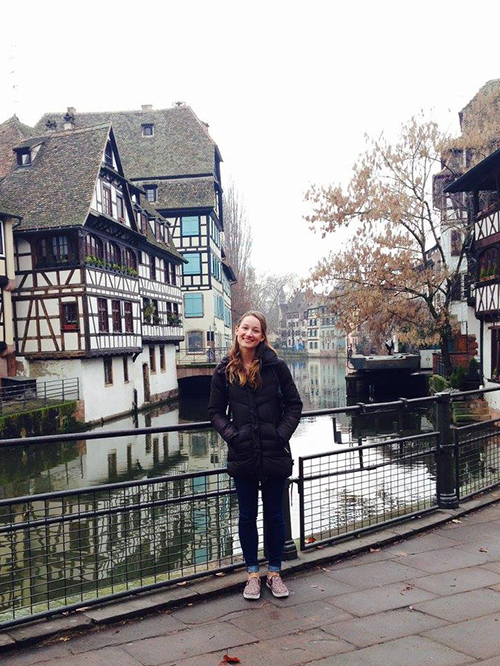 "Though I always knew I wanted to study abroad during my undergraduate career, I chose Strasbourg after meeting with Timothy Carlson, co-director of IFE, also known as the Institute for Field Education. The intensive academic program combines regular classroom study and lecture with real field experience. Though IFE Strasbourg is a program that uses French as its main working language, I was permitted to complete two internships across the border in Kehl, Germany, working in a binational organization focusing in cross-border litigation and Franco-German issues. Strasbourg was the ideal way for me to continue learning French and German and to apply my language skills in real time." Gottbrecht began her application in September of 2017. For her, it was a bit of déjà vu. "I began drafting my two essays for the application, which included a statement of grant purpose as well as a personal statement. I felt as though I was writing my college application essays all over again!" said Gottbrecht. "Much like a thesis-driven essay, you have to remain focused and concise in your argument and demonstrate why you are a good fit for the Fulbright Program, while also effectively showing them your energy, drive, and personality. I started from scratch, and met regularly with my German professor to discuss my ideas, stories, and revisions. After my statements were complete, Guilford's Fulbright advisor conducted an on-campus interview with two other faculty members. My German teacher was also present to test my German knowledge and fluency. " While Gottbrecht plans to move across the ocean yet again, she is grateful for the strong foundation she received here at Germantown Academy. "I see all of my teachers, past and present, as having an impact on my pursuit of foreign language and love of learning," said Gottbrecht. "I began learning French at GA in sixth grade with Mrs. Wagner, and continued through the Upper School with Mrs. Test and Mr. David. We read books and plays, saw musicals, and even had tests to identify French cheeses (not kidding!). In my senior year, I doubled up on my language courses, and took Advanced Beginning German with Mr. Schellhas. I owe much of my success to GA and Mr. Schellhas himself, who created the opportunity for me to study German during my last year. "Moreover, I spent much of my life at GA as a lifer," continued Gottbrecht. "I truly believe that it was at GA where I learned how to write well, thanks to Mrs. Graffam and Mrs. Burnett. I first became passionate about history after taking a class with Mr. McVeigh my sophomore year, and later AP European History with Mr. Mattern, which ultimately led me to major in International Studies. Every teacher at GA has impacted me in some way, and I am so grateful for GA's high standards, talented educators, and emphasis on learning for the sake of learning."